King Mohammed VI’s energizing vision of Morocco’s role as a platform for business development in central, west, and Atlantic Coast Africa resulted in a number of initiatives in 2014. The critical value of several of these projects was recently highlighted in a new publication released by the Atlantic Council’s Africa Center, “Addressing the Food, Water, and Energy Nexus: Transatlantic Perspectives and Africa’s Great Chance.” The report was released at a seminar featuring the author, Peter Engelke, Strategic Foresight Initiative Senior Fellow at the Center; former assistant secretary of state for Africa, Constance Berry Newman; and Robert Thompson, former assistant secretary for economics at the Department of Agriculture. The report and seminar focused the food, water, and energy nexus at the heart of development challenges in Africa. As Dr. J. Peter Pham, Director of the Africa Center, said in his opening remarks, the challenge is how to secure sustainable progress in meeting the growing demands for food, water, and energy within theeco-system constraints on the continent including infrastructure, environmental degradation, human and social development, and leadership. Peter Elgelke continued this theme in reviewing some of the key barriers to addressing this “nexus,” including perceptions of risks versus rewards related to security and the environment. He has developed five core principles “to guide the planning, production, regulation, and use of the food, water, and energy nexus, and for the ecosystems that sustain the nexus.” As an example, he pointed out that in the US, the food production process is quite efficient, while there is great waste on the consumption side. Conversely, in poor countries, the production and distribution systems are weak, while they are quite efficient in consuming whatever they can of existing resources. Robert Thompson, who also participated in the earlier launch of the Atlantic Council’s nexus project – supported by Morocco’s OCP Foundation – in commenting on the report noted the value of having integrated teams working on the nexus, bringing the best thinking and practices to the dialogue. With the doubling of food demand in Africa by 50 percent due to its expanding population and rising urbanization, there must be significant increases in productivity. He believes that by using current technology more efficiently and effectively, agricultural output can be raised by 75 percent in Africa. And the lack of an aggressive public policy commitment to resolving the nexus issues is the most critical challenge facing Africa. Former Secretary Berry Newman reiterated the need for nexus management and building short-term benefits into a long-term strategy so that the poor will participate. She believes that ministries and agencies acting as silos and the lack of coordination among donors can be dealt with through more fieldwork to put nexus issues on the agenda for policy makers and corporations. Farm in Morocco. Photo credit: World Bank on Flickr. How does Morocco measure up to these concerns? We have previously referenced the more than 80 agreements signed by Morocco in sub-Saharan Africa this past year and how they are the backbone for a more vibrant South-South relationship. 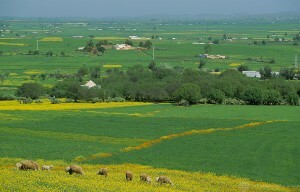 Although the agreements cover sectors such as finance, trade, tourism, power, education, housing, and ports, perhaps the most critical in terms of its regional impact are those affecting agriculture, both in terms of better use of fertilizers and related projects appropriate to specific growing areas and crops. As my colleague David Bloom has previously pointed out, “In sub-Saharan Africa, where corn yields per acre are ten times lower than those in the US, one glaring deficiency is fertilizer use. On average, sub-Saharan African countries use about 17kg of fertilizer per hectare of arable land; whereas countries like France and the US use around 150kg and 120kg, respectively (based on World Bank data).” The importance of greatly expanding agro-industry cannot be overstated since more than 40 percent of Africa lives in absolute poverty despite the fact that the continent holds more than 60 percent of the world’s under- and un-utilized arable land. The agreement entails building two downstream fertilizer complexes devoted to African markets. It would marry Morocco’s phosphates with low-cost gas essential for processing phosphate rock. Since Morocco has to import gas, this partnership eliminates the most expensive factor in downstream production and gives Gabon, and other African countries, a ready supply of localized fertilizer products. Morocco’s priorities in renewable energies, in regionalization of phosphate applications, and its overall commitment to South-South development move the nexus discussion forward from “talk to actions” and hopefully provide opportunities for policy makers to overcome the risks in resolving the food-water-energy nexus.